The Black Madonna – Her next appearance is in your heart. You awaken in us that which we do not know. reminding us that all is not as it seems. You stand watch for the true truths. There is a Mother. A good mother. No matter how they have silenced your story. You stand watch and we sing to you. have tried to be whited out. when the world seems to have gone mad. that want to be told for generations. When I think of you I think of this good earth. save our art and our songs. and the power of the child who rises from death. of that which is killed coming back to life. your voice or the voice of reason or true dreaming. Forgive them, for they know now what they do. But this time, they do know what they are doing. Our leaders have lost their way. and we don’t know how to stop them. red poppies in fields of green. of the sea teaming with fish. I think of unconditional love and good deliverance. I think of you giving birth in a cave. and wipe the tears from my cheeks. to a revolution that saves. so please pour out your heart to us. and reaching for your hand. and calling upon your saving child. a pour out your heart revolution. I wrote the poem above last year when I first got the gift of coming into contact with the Black Madonnas. If you haven’t ever seen one it is hard to say how it feels, the transmission, both ancient and futuristic moving through space and time to your heart. As I read it and continue to learn about the harm on our planet and to earth creatures and winged and four legged I cannot help but wonder what will become of us. In my heart I feel a combination of deep peace mixed with wonder and yes, some fear about what I see happening in the lives of those I love….so much suffering each day and so many prayers and side by side with all this joy. Funny thing is I forgot I wrote the poem or call for help at all – just forgot. Yet there it is – with me talking about not silencing her or the stories that have tried to be ‘whited out’ – I didn’t even know how true that would become. I wrote the letter below while I was in Paris on my recent trip about my experience with her. Whether you have a connection to her or not it is worth considering, pondering, what have you heard and why? What comes up for you? My relationship to her and the feminine is strong and ever changing and moving like a river to the sea…winding it’s way around. And yes a great mystery. As I sit here writing this to you I am at Cosmic Cowgirls setting up the Altar for the Lady and for our in person guests. Jonathan is setting the equipment up and tomorrow we will have his son Alex here to support with our first in person and online experience. At the same time I am emailing with Luisa Teish about our upcoming class having to do with water and mermaids, and I am listening to Jennifer Berezan’s song, Returning. And texting with one of my BFF’s Elizabeth Gibbons about her upcoming mermaid workshop. Mermaids, Magdalenes and Black Madonnas – I think I am in the right place. Add chocolate and I am good. I am hoping your days are filled with beauty and wonder. Because despite the challenges, the beauty stops me, and I have to catch my breath in awe. I am writing to you from Paris. It is my second year here and my chance to see Black Madonnas in person. Perhaps you will enjoy hearing my story and will tell me your own. 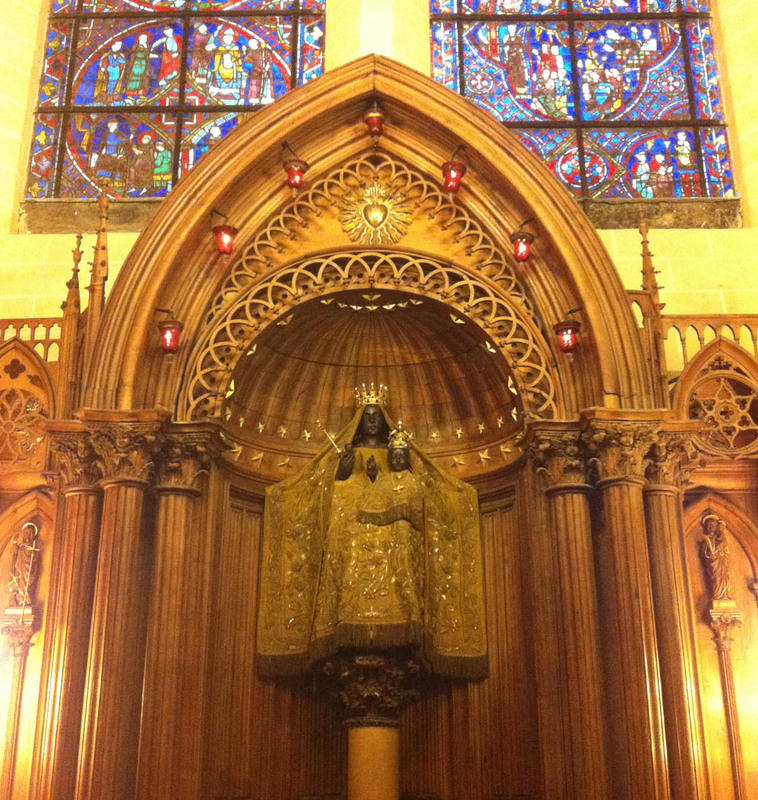 This year however when I visited Chartres for the second time, I had a quite a surprise. The Lady of the Pillar was different this year, instead of being Black, she was white. I still find it difficult to speak about the impact this restoration had on me, and on many of the students traveling with me. So we are exploring her in our paintings…. 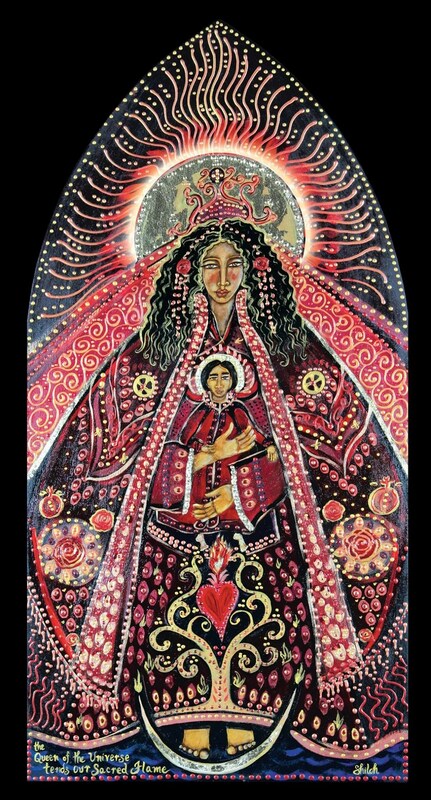 As a Christian Orthodox woman, I get the gift of living consciously and openly with the Great Lady and her child Jesus, since she is very present in many skin colors in my tradition and she also holds the red thread. I am intimately connected with the Lady and have been for close to twenty years but still find myself rather speechless to try to explain the intricacies of my relationship with Her and plus it changes and breathes. However, when we paint Her, she comes to life in our hearts – She makes an appearance in our hearts and finds home there within us. There is solace here. I invite you to spend the day with me, and in the presence of the Great Lady in Her form as none other than the Black Madonna. There are close to 500 Black Madonna’s all over the world – and her next appearance is in your heart. 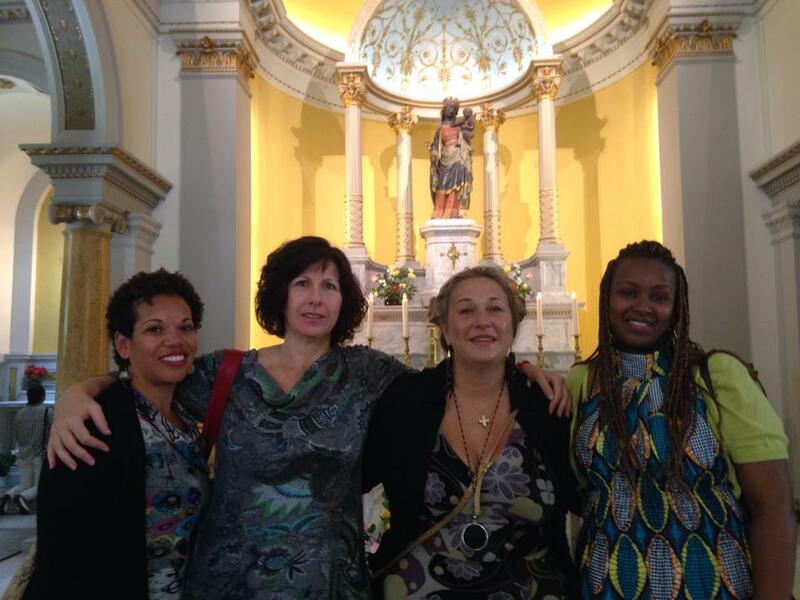 Lauren, Cynthia, Shiloh and Carol at the Black Madonna of Paris – after the Chartres experience we needed to see a Black Madonna.